(10) Bangladesh was recognized by Pakistan during this Summit Conference. 2. (i) Highlight the role of Sindh Province in Pak. Movement. 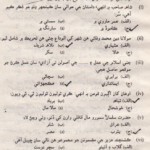 Sindh had been a place of scholar, social reformers and politicians. Sindh played a key role in the Pakistan Movement. Pakistan Resolution was passed by the complete support of Sindh. Sir Abdullah Haroon from Sindh delivered an excellent speech in support of Pakistan Resolution. 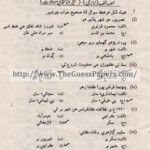 In the elections in 1946 Sindh regarding inclusion Pakistan or not, G.M. syed was defeated and Muslim League won all the seats from Sindh. That is why Sindh provisional assembly voted unanimously for inclusion in Pakistan. (ii) Write 3 sentences on Trade & Commerce. (iii) Write three main objectives of Aligarh Movement. (iv) Write three steps for the industrial development in Pak. (v) Write any 3 agricultural problems of Pak. (i) Water logging and salinity are the major problem in which underground water level rises up to the surface and salt and other harmful chemical which come up make land unproductive. (ii) Shortage of rainfall not only affects natural water supply but also makes the water level drop in the rivers. (iii) Agriculturists have hardly adopted modern methods and that is why the yield per acre is very low. (vi) Write down any three points out of the 14 points of Quaid-e-Azam. (i) In the Central Legislature, Muslim representation shall not be less than one third. (ii) Any territorial redistribution shall not affect the Muslim majority in Punjab, Bengal and N.W.F.P. (iii) Full religious liberty shall be guaranteed to all communities. (vii) Why was East Pak. separated from West Pakistan? Write any 3 causes of separation. (iii) Army started military action against the- separatist movement of Awami League. This created hatred among Bengalis and they also started armed struggle. (viii) Write three characteristic of Culture. Culture is the combination of traditions and customs, collective and individual behaviour during peace and war, methods borrowed from others, science, religion and art which is not the heritage of past only but also the analysis of future. (ix) Write the fundamental contents of Islamic Ideology. (x) Write down three sentences on utility of Urdu Language. (i) Urdu is used as a common speaking language in all provinces of Pakistan . (xi) Write down any three objective of the education of Information Technology. To modernize educational system by introducing information technology. To provide access to research and modern information through the internet. To employ communication technology for the training of teachers and other educational activities. (xii) Write three important duties of Islamic Welfare State. (i) The foremost duty of welfare state is the setting up of an Islamic Society. (ii) To establish an Islamic policy based on the principles of equality, justice and mutual respection cooperation. (iii) To provide equal opportunities for progress and don not fall victim to ignorance, poverty and exploitation. (xiii) Write down three sentences on moderation in life. Moderation is the foundation of the economic prosperity because its creates a final state of peace in the nation. Moderation is a source of providing a peaceful life. Moderation provides help in the planning of future. (xiv) Write down three sentences on Pakistan Resolution. (xv) Write down three sentences on the 3rd June Plan. In March 1947 Lord Mountbatten becomes the Viceroy of Sub Continent tried to keep the Sub Continent united but fails in his efforts. He finally come to the conclusion that there was no other possible solution of political problem of the Sub Continent except to partition. On 3rd June he announce the plan of the partition. According to it the power would be given to Pakistan on 14th August. This bill was passed and carried to be known as Indian Independence Act 1947. 3. (a) Hightlight the prominent points of the character of Quid-e-Azam which make role model for others. (i) Principle liking: He was a principle liking person. He made his life as a sum of principle. He always acted upon whatever he said or promised to do. (ii) Intelligence: He was an intelligent leader and combine the traits such courage, sense of responsibility, integrity and dedication. (iii) Strong character: He had a strong character and did not compromise on his principles. (iv) Devotion: He devoted his life for the cause of Muslims of South Asia. The aim of his life to protect the rights of the Muslims of Sub Continent. (v) Youth Favour: lt was a great equality of his personality that he always supported and admired the youth. He called the students the builder of the nation. (i) Majority of the people believe that Allah is the sustainer and Provider. Many people think that having a large family is a source of strength. They also consider family planning contrary to Islamic teachings. (ii). Family planning practices have not gained popularity in the Pakistani society as yet. (iii) The low literacy rate also contributes to the higher population growth. (iv) Early marriages also add to the growth of children. (v) Poverty is yet another reason. The growth rate among the poor is greater as compared to other groups of society. The reason is that they don’t bother about the standard of life and providing good education to their children. .
(vi) The desire for a male child results in producing more children. In the rural areas, more male children are considered to be an asset for the family and a sign of pride among the kith and kin and others. The importance of education in Pakistan is much but due to the growing population, high standard of the education could no! be achieved till now. The literacy rate in Pakistan is very low inspite of all efforts have been made by the government. The standard of Primary education is far from satisfactory. The teachers at the middle level are dissatisfied with the level of primary education and secondary school teachers complain about the standard of education at middle level and so on. The students admitted in medical colleges are mostly unsuccessful in the first professional examination. Government has started a programme of public-private partnership for increasing primary level education. Government has also started a scheme. Under the scheme thousands of non-formal schools are being opened to improve the literacy rate and provide facilities to primary education. 4. (a)What are the important national goals of Pakistan? Pakistan is an Islamic state, there fore all fundamental national goals of Pakistan have determined according to Islamic ideology of the First fundamental goal is the establishment of Islamic society and the development of Islamic teaching. The foremost national objective of Pakistan is the setting up of an Islamic society as per the teachings of Islamic and principles of democracy. Quaid-e-Azam had said that the purpose of the creation of Pakistan was not just obtaining a piece of land but objective was to establish a laboratory were we could practice principle of Islam. It is also a national objective of Pakistan to establish an Islamic Polity, based on the Principles of equality, Social Justice, mutual respect and cooperation. This is possible when people get equal opportunities for progress. An important national goal of Pakistan is defense the state of the safeguard the country from internal and external janglers. Self sufficiency is used in extensive way but self sufficiency in Pakistan means to develop Pakistan economically. Pakistan must be made economically self sufficient. This would require sustained efforts at national level to work hard. Depend upon our own resources and promote education scientific knowledge. The unity with Muslim countries is also a fundamental goal of Pakistan. It is also our national objective to promote unity among the Islamic countries and unite them on one platform. We have to strength is the role organization of Islamic countries (OIC) so that a uniform stand is taken on the issues concerning the interests of Muslim Ummah. It is also a national goal of Pakistan to cooperate the efforts which are being done for international peace and prosperity. Promotion of international and regional peace, reformation of the unjust international economic system and elimination of racial discrimination are also our national objectives. (b) What role should Pakistanis play for the Prosperity of the country? The guidance and encouragement of trained and private sector is the need to continue our struggle for more development and make Pakistan a developed country. 5. (a) Mention the principles of Democracy in Islam. Democracy is a form of government in which all the people of the state select the representatives for the government through their votes. In Islam the concept of democracy is different from the rest of the world. In an Islamic democracy such people are elected to run the affairs of the state who follow the Islamic principles in their lives and are able to work according to the teachings of The Holy Quran and Sunnah. Following are the principles on which the foundation of democracy in Islam has been established. The first principle of Islam is that sovereignty over the entire universe belongs to Allah. The representatives for the government have to use their power with in the limits prescribed by Islam. Even the legislative assemblies cannot go beyond this. Establishment of justice in the society is the second basic principle of democracy in Islam. No aspect of life can be complete without justice. It makes any society peaceful and prosperous. A society having supreme justice enjoys unity, live, sincerity and peace. prophet declared that “All human beings are offspring of Hazrat Adam and no Arab is superior to a non-Arab. Fraternity as brotherhood is the fourth important principle of democracy in Islam. In the Holy Quran Allah has sad that all believers are brothers to each other. The feeling of brother hood promotes affection, mutual, co-operation, selfless service and sacrifice. In this way, the society becomes peaceful. (iii) Mineral Resources of Pak. (i) Sovereignty over the entire universe belongs to Almighty Allah. The political powers are sacred trust which shall be exercised by the representatives of the people within the limits prescribed by Islam. (ii) The principles and concepts of democracy, equality & social justice enunciated by Islam shall be enforced within the country. (iii) Muslims shall be enabled to lead their individuals as well as collective life in accordance with the principles set in the Holy Qur’an and Sunnah. (iv) The rights of the minorities shall be protected. They will have the freedom the follow their religion and promote their own culture. (V) Federal system of government will be introduced in Pakistan. (vi) Fundamental rights of the citizen shall guarantee on the basis of equality and social justice. An important source of energy is nuclear energy. Uranium which is a heavy grey radioactive metallic element is :used for the production of atomic energy. In Pakistan two atomic power houses are working. One is at Karachi which started its work in 1971 and the second is at Chasma in Mianwali. The Chasma plant started producing electicity in 2002.Its production capacity is 300 mega watts. A third atomic power project is being constructed at Chasma with the collaboration of China. Atomic energy is also used for peaceful purposes lt is used in agricultural research. Atomic energy is used for the treatment of cancer. (i) Mineral Oil: It is not used in factories and mills as a fuel, but the transport system also depends on it. Moreover, it is domestic use also as a cheap fuel. Pakistan is an oil rich country but due to slow process of exploration the discovery of oil fields, commercially useful has been very few. The oil resources of Pakistan are located in Potohar Plateau, Khor, Dhullian, Kot Mayyab, Attock, Chakwal, Jehlum, Dhodak, Badin, Hyderabad, Sanghar and Dadu districts. Sui, Uch, Khairpur, Mazrani, Bari, Sandahk, Dhodak, Piroh, Dhullian, Meyal, Murree, Badin, Golarchi and Turk. The gas is used in cement fertilizer and general industries. It is also used for producing thermal electricity. (i) The Salt Range and Makarwal Coal field. (ii) The Northeastern Balochistan Coal fields. (v) Chromate: Chromate is very important metallic mineral. It is used in making stainless steel, high speed tools precision instrument, dyes and photography. Pakistan is the top producer of this metal in the world. A large quantity of Chromate is exported to other countries. The deposit of chromate are found at Muslim Bagh, Chaghai, Kharan, Malakand, Mohmand and North Waziristan. (vi) Copper: Copper is an important industrial metal. It is used in electric goods and especially in making copper-wire. The deposits of copper are found at various places in the NWFP and Balochistan province. The most important deposits of copper occur in Sandak and Amori in the district of Chaghai. (vii) Lime Stone: Limestone is largely used in making cement, ceramics and other allied industries. Many cement factories have been established at the places where limestone is commonly found in large quantities. Limestone is also used in construction work. Limestone is available in large quantities at Dandot, Dawoodkhel, Rohri, Hyderabad and Karachi. (viii) Sulpher: Sulpher is an important mineral, which is used, in Chemical industries, fire arm industry and match factories. It is also used for gunpowder. It is found in Koh-e- Sultan, Jacobabad and Mardan. It is refined and made suitable for use at the factories established at Karachi and Quetta. (ix) Marble: Marble is another mineral wealth, which is found in abundance in NWFP and Balochistan province. It is of several goods kind and colours. The best kind of marble is found at Mull Chori near Peshawar. Marble is used for flooring and fixing at wall for beautification. Pakistan earns a good amount of foreign exchange by selling this mineral. Multi colour marble found in Pakistan has great demand in foreign countries. Marble is found in the district of Chaghai, Mardan, Sawat, Khyber Agency, Attock District, Mirpur and Muzaffarabad. (x) Salt: Salt is used in cocking, it is also used in the manufacture of washing soda and hydrochloric acid. Vast de,posits of mineral salt are found in Khewra, Warrach, Kalabagh, Bahadukhel and Kark. The country has one of the largest deposits of Rock Salt of the world Salt is also obtained from Sea water at Karachi and Makran Coast. (xi) Gypsum: Gypsum is a non-metallic mineral. It is a bright stone of white colour. Gypsum is a valuable source of wealth. It is used for making Cement, Plaster of Paris, fertilizers and boards. It is largely used in a number of small industries. Gypsum in large quantity is found and obtained from the following areas. District Jhelum, Mianwali, Dera Ghazi Khan, Quetta, Sibi, Loralai, Kohat, Bhawalpur, Dadu and Thar. Pakistan can be divided into following natural regions with respect to its geographical location. (ii) North – Western and Western Mountains ..
(iv) The Chaghai and Kharan Desert.